Here is a simple guide on how to obtain Inner Line Permit in Ladakh, which is essential for visiting several areas close to the Line of Control (LOC with Pakistan) and Line of Actual Control (LAC with China), which were earlier closed for the tourists. In case you have any doubts on the procedure mentioned below, please post a comment by scrolling to the bottom of the page and I will attempt to clarify the issue, as best as I can. Foreigners NRIs, PIO Card and OCI Holders are required to obtain Protected Area Permit (PAP), in order to visit Nubra Valley, Turtuk, Pachathang, Tyakshi, Pangong Tso (till Merak Village), Marsimik La, Tso Moriri, Loma Bend, Dah and Hanu Villages, Dah – Garkone – Darchik – Batalik- Slimo – Kargil and Kargil – Khangral – Shaker – Chiktan – Leh route. Foreign nationals cannot get permit for areas like Hanle and Chushul. Protected Area Permit is only issued for a group of 2 or more travelers and that too through a travel agent. While it is essential for foreigners to apply for permit through a travel agent, who would generally group them together with other foreigners (in case an individual or less than 2 people are applying), in order to obtain the permit. However once you have the permit, you are free to travel on your own and need not travel with other people mentioned in the permit or for that matter, with the travel agent, since that rule is not enforced on the ground, just at the point of permit issuance. Permit for foreign nationals are issued for a maximum of 7 days. Permit for Bangladeshi, Pakistani, Chinese, Afghani and Burmese citizens, is issued by the Ministry of Home Affairs in Delhi. You need to carry photo copies (3-4 per sector eg. Nubra Valley, Pangong Tso etc.) of the permit with you, while traveling to the restricted areas and submit the same at various check posts en route. You also need to keep your passport handy for checking. Here is a detailed FAQ on Protected Area Permit by the Ministry of Home Affairs (MHA), click here to download pdf. 1. Name, father’s name and address of people who need the permit. 2. Places for which the permit is required eg. Nubra Valley, Pangong Tso, Marsimik La etc..
3. Dates and duration for which the permit is required (inner line permit is issued for a maximum of 3 weeks). 4. Guest House/Hotel you are currently staying at. Along with the above details, one needs to attach photocopy of Photo Identity Card for every individual applying for inner line permit. After duly filling the form and attaching the necessary documents, you need to submit the same at the small room (on the left hand side) right after the main entrance of DC Office in Leh and also pay the appropriate fee (at the time of writing, Rs. 200 per person environment tax + Rs. 20 per person per day wild life protection fee + Rs. 10 Red Cross donation) and collect the permit. Once you obtain the Inner Line Permit, you need to make enough photo copies of it to submit at various check posts en route, generally 3 copies per sector are required, but you may require more if you are planning to take alternative and less visited routes mentioned below. Off the beaten path: If you are planning to travel to places like Chushul, Hanle, Chummur etc. then you should not only mention these places on the permit, but also the major villages which will fall en route eg. 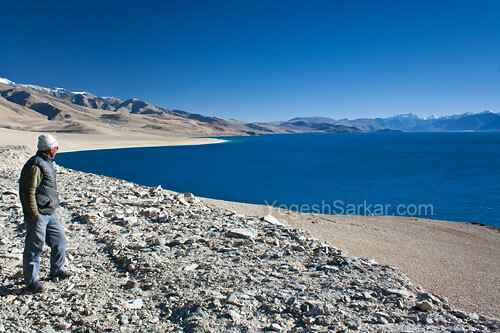 in case you are planning to take Chushul route from Pangong Tso to Tso Moriri with a stopover at Hanle, then you need to mention the following places; Pangong Tso, Man, Merak, Chushul, Tsaga, Loma, Nyoma, Mahe, Hanle and Tso Moriri. However permit for these areas may or may not be given based on various factors and you may have to personally present your case to the ADC, in order to obtain the permission. Applying for permit through a travel agent/guest house: You need not be personally present at the DC Office to obtain the permit and travel agents and majority of guest houses in Ladakh would be all too happy to arrange it for you, for a small fee :). This option can come in quite handy if the only free day you have in Leh is a public holiday or if you wish to get the permit made in advance eg. for covering Tso Moriri while going from Manali to Leh. Leh DC Office working hours: You can apply for permit at the DC Office on all working days (Monday to Saturday), between 10AM to 3PM. While you may be able to get the permit made after 3PM, however it is best to not count on that and apply before 3PM. Our family of 4 are planning a trip to Ladakh. While 3 of us are Indian citizens living in India, my 9 year old son is a US Citizen with a PIO Card. Will we have issues travelling with him? Is he/she on diplomatic visa or on a UN mission? If not, then a travel agent in Leh would arrange the permit. Otherwise they will need to get their embassy to forward the application to MHA or you can try getting in touch with someone at Ministry of Home Affairs, Foreign Division, Jaisalmer House, 26, Man Singh Road New Delhi. Sir we are 5-6 people planning for the visit to Leh. Will you please suggest us the best places to visit and the lakes around the area which is best for camping. And please suggest me if the bikes below 160cc are good to use such as apache 160, discover 150 etc. etc. Pangong Tso and Tso Moriri are beautiful lakes and there are camps near the lake, where you can stay or pitch your own, after paying money. Same also holds true for Nubra Valley, which is a must visit. Mana Pass conquered on motorcycles!